Dr. Julia McNamara, President of Albertus Magnus College, welcomed the Collaborative Strategic Planning Task Force members to the two day orientation and training session. Mr. Joseph Crespo, Chairman of the Board of Trustees, discussed the importance of Strategic Planning from his experience in the corporate world and emphasized why the inclusive, anonymous, and transparent approach that the College is pursuing is so very valuable to designing a successful strategic plan. Our facilitator, Dr. Patrick Sanahan, welcomed the participants and provided a brief history of his career and his role in this process. He then explained to the PTF (Planning Task Force) the expectations for the two day orientation and training session. The Purpose/Outcome of the training sessions include learning to conduct collaborative meeting designs and developing next steps so that PTF members have a clear vision of their role and the process, as well as generating the first data and information for the planning process. Accomplishments Design. The PTF identified Albertus Magnus College’s past successes and recorded the data created by the process. The information that resonated most strongly from the data gathered during the process was the importance of, communication, champions, ownership, resources, and cross boundary collaboration in Albertus’ successes. The PTF members will utilize the Accomplishment Design strategy they learned when they reach out to other members of the College community to gather more input and data. Carousel Design – SWOT Analysis (Strengths, Weaknesses, Opportunities, Threats). Using a round-robin approach, the PTF listed Albertus Magnus College’s Strengths, Weaknesses, Opportunities and Threats. The data were collected and will be incorporated with results from other groups. The PTF discussed the pros of the Carousel SWOT design — which included, full participation, transparent process, and anonymity — as well as the drawbacks, including that the activity moved too quickly and the lack of opportunity to complete the process a second time. The PTF members can utilize the SWOT strategy they learned when they reach out to other members of the College Community to gather more input and data. Future Timeline Strategy. The charge was for PTF members to think about the events, trends and issues that could impact Albertus Magnus College, both positively and negatively over the next 5 to 10 years. The data were gathered and will be combined with additional data from other time line strategies performed with different focus groups to identify the biggest and toughest trends/events/issues that Albertus must address going forward. The PTF members can utilize the Timeline strategy they learned when they reach out to other members of the College Community to gather more input and data. Thinking Styles Exercise. After self-selecting from a choice of 4 categories of thinking styles, the PTF members met with like thinkers and generated a visual map of the kind of meeting they would like to have if they were in charge, created a motto to live by, and a logo that best represented them. A discussion followed regarding the impact of thinking styles on group dynamics, the natural tensions that will occur between certain thinking types, and the fact that all thinking styles are needed. Cascading Agreement Strategy. Groups of three made with each group containing three persons with different thinking styles. Each group was tasked with coming up with questions regarding Albertus Magnus College that they would really like answers to. The data were assembled and the entire group then selected the top 6 questions that they would like to see answered, i.e, “Why Albertus?” These questions, along with a few others, will be used by the PTF in the series of meetings they will have with members of the College community. Reviewed days agenda and answered questions regarding Collaborative Strategic Planning process and the role of the PTF. Interview Design Strategy, performed by PTF using five of the six focus questions chosen on Monday during the Cascading Agreement Strategy. After completing the initial Interview process, the PTF discussed the pros of the Interview Design Strategy — which included, anonymity, short and to the point, massive amounts of data collected, and the fast pace — and the drawbacks of the Interview Design Strategy, including the tendency to respond to the person you were interviewing instead of only recording their answer, trouble reading handwriting due to fast pace, and distraction from proximity to other interviews. An alternate Interview Design strategy was presented that was a Group Interview Design Strategy. The pros and cons of this alternate design were discussed. The pros of this alternate Group Interview Design included the ability to build off of each other’s statements and the slower pace which allowed time for reflection. The cons of this design included the loss of anonymity and the naturally occurring group suppression of individual thinking. Using self-selected roles of recorder, presenter, facilitator and time keeper, the data captured using the Interview Design Strategy was organized into truths (meaning that a statement was made by almost all people), trends (statement made by many people) and unique ideas (statement made by only one or two people but with remarkable insight), to be assimilated with other data collection. The PTF members can utilize the Interview Design Strategy they learned when they reach out to other members of the College Community to gather more input and data. Talent Bank. 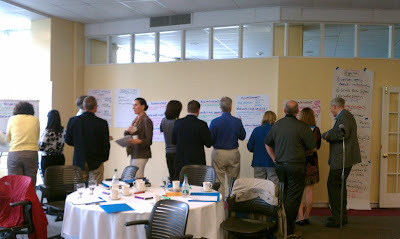 Members of the PTF paired with a partner and identified individuals from the Albertus Magnus Community who they thought might be of assistance with the Strategic Planning process in one of eight categories: Content Experts, Facilitators, Writers, Editors, Research, Community People, Technology Experts, and Visionaries. Mindmapping Exercise. In order to practice this exercise the members of the PTF were asked to use the mindmapping exercise to answer the question “What stakeholders might we meaningfully engage if we are going to be as well informed as possible?” Then the PTF identified priority stakeholders from the mindmapping exercise. The PTF members can utilize the Mindmapping Exercise they learned when they reach out to other members of the College Community to gather more input and data. PTF partners were picked to work together when meeting with other groups on campus and elsewhere. The partners consisted of a faculty person paired with an administrator or other staff person. Each set of partners selected two stakeholder groups they would contact, the process/design strategy they would employ (Accomplishments, Carousel SWOT, Timeline, Cascading Agreement, Interview Design, Mindmapping, Survey), how many individuals would participate in the process/design, and the estimated time frame the partners would perform the activity in. Some partner groups may have opportunities over the summer to start the planning process, for example Reunion weekend will offer opportunities for the PTF to engage alumni in the Collaborative Strategic Planning process. Materials/supplies would be made available to PTF members by contacting the Administrative Assistant to the Vice President for ITS and room reservations and other resources would be made available to PTF members by contacting the Administrative Assistant to the Academic Dean for the Day College.